Promise of rain today. Hot and humid...however, we had a bright evening filled with cold water and breezes in Sheldrake. Roof still coming along. Henry and team come before 7 a.m. and start work, full bore with the ripping and throwing of tiles and paper.No end to industry with that crew. Rumor has it that I may get my thesis back to amend and finally print. Work at the office is keeping us busy but not crazed. The picture of Shady is coming along. 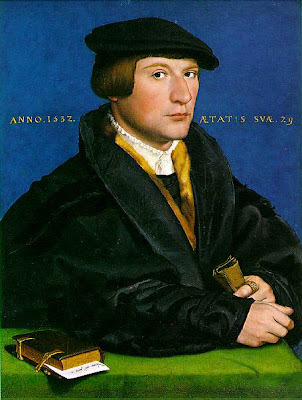 My thnking is to create another layer of selected highlights to pull her face out, work with feathering the beige/tan tone in the background to be more Holbein-y, along with typography inspired by his portrait, Portrait of Hermann von Wedigh III, 1532, . Love the type in the later paintings. May look for more clues from this wonderboy. More later. The wonderbus needs to go to Odessa to deliver to Basketball encampment.